The term 'early warning' is used in many fields to describe the provision of information on an emerging dangerous hazard that enables advance action to reduce the associated risks. Early warning systems exist for natural geophysical and biological hazards, complex socio-political emergencies, industrial hazards and personal health risks, among many others. 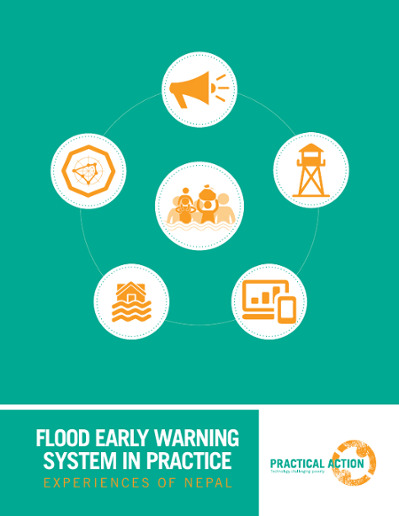 Early warning is a major element of disaster risk reduction. Early action can often prevent a hazard turning into a human disaster by preventing loss of life and reducing the economic and material impacts. To be effective and sustainable they must actively involve the communities at risk. Early warning systems can be set up to avoid or reduce the impact of hazards such as floods, landslides, storms, and forest fires. The significance of an effective early warning system lies in the recognition of its benefits by local people. Practical Action is working in many countries that are regularly affected by natural disasters. In these countries we use cutting-edge resilience measurement tools to explore innovative early warning systems with hazard-prone communities to provide the advance warning they need. The more time we can give communities to prepare, the greater the savings in human life, household assets, livestock and stored provisions will be. Nepal ranks as one of the most naturally risk prone areas in the world. Affected by floods, earthquakes and landslides, the lack of investment in risk reduction is obvious throughout the country. Practical Action has been working in Disaster Risk Reduction (DRR) in Nepal since 2001. Since 2013 we have supported the Nepal Risk Reduction Consortium, a national platform that provides technical advice on DRR. Practical Action has provided technical advice on flood early warning systems to help protect communities from the regular flooding in the Koshi river basin. This publication helps summarise Practical Action’s learning in EWS and offers practical insight in to how such systems can be replicated and developed elsewhere. Peru is one of the most naturally risk-prone countries in the world. It is located on the “ring of fire”, a tectonically active area that is regularly influenced by the “El Nino” phenomenon. The combination of seismic activity and climate variability creates a very high risk and great uncertainty with regards to when the next natural hazard will strike. In February 2010, a year of unusually high rainfall, the town of Zurite in Cusco region was deluged by a massive mudflow. The landslide of mud and stones covered the Plaza de Armas, the town’s Church, and the main streets of the city, damaging over 500 houses. The incident appears to have been exacerbated by mining on the hill slope which had excavated the toe of debris from a historic catastrophic flow event. Based on this experience, Practical Action has been working with the University of Cusco to develop an early warning system to monitor the slope above the town. The system has been designed and built around locally available components and utilises the accelerometer, the stress gauge, and the inclinometer sensors that are present in most cheap smart phones. The sensors have been installed above the town and are monitoring the slopes for instability. By collecting this information alongside weather data, we are starting to understand the factors that lead to slope failure. This knowledge is then used to inform the development of an effective early warning system. This hill, along with virtually every other hillside in Peru, is highly unstable and could fail at any time. If this happens at night, the impact would be catastrophic. By providing simple and locally appropriate early warning systems we might be able to reduce the impact when the next mudflow occurs. Let’s stop disasters happening – a great example! Forecasting refers to the prediction of future weather events and trends, tested against historic data. Along with Early Warning Systems, forecasting has the ability to deliver immense benefits in the form of improved planning and preparedness, especially when combined with indigenous knowledge of past trends. Unfortunately very few people in the developing world are receiving these benefits and their wellbeing is therefore compromised. Developing countries face huge limitations in technical capacity, especially human capacity to install, maintain and manage forecasting systems; organisations like Practical Action with our expertise in Technology Justice therefore have a real contribution to make. We are skilled at developing systems in partnership with local stakeholders that deliver information that is designed for them. We recognise the need for interfaces that can support local languages, the value of building on indigenous knowledge, and the need to link science to local systems and ensure that forecasting and early warning information is understandable by local people. Will agroecology, smallholder farmers and technology justice be adequately considered in Bonn?